Throughout my teenage years I had a keen interest in sport, my main passion being ski racing where I became National slalom champion at the age of 14, I ran for Surrey County in the 100m sprint and loved being part of various netball teams. Needless to say I became fascinated with how the body works and the treatment of injuries thus creating my path to a career in chiropractic! After discovering the gentle nature of the McTimoney technique I went on to study at the McTimoney College of Chiropractic in Oxford, graduating in 1997. During my practice I have had the privilege of helping many different people from National sports persons to Rock stars, young children to 90 year olds wanting to keep going. 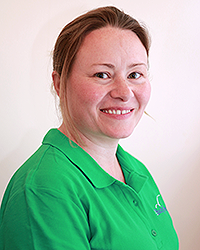 Family life has given me a valued insight into treating children, promoting my focus and further studies on paediatric care and now, having teenager’s helps with evaluating the everyday stresses and strains their bodies go through and the pressures they are under. I love the gentle nature of the McTimoney technique as it allows all ages to benefit from re-alignment of the spine and other joints of the body and I find practicing the McTimoney technique very rewarding. Over the span of nearly 20 years, I have watched the profession develop and have had the opportunity to work alongside other practitioners, sharing knowledge and attending regular professional development keeping up to date with changes and developments within the profession. I am a member of the McTimoney Chiropractic Association and registered with the General Chiropractic Council.